FlexChem is one of the industry's most versatile, rubber covered FEP-lined transfer hoses. It is designed for full flow applications that require maximum flexibility, minimum weight, high purity. 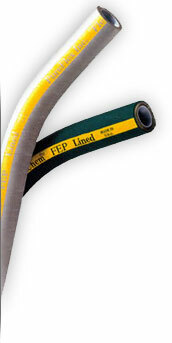 This smooth bore FEP hose with its EPDM rubber cover is easy to handle and resists abrasion and chemical attack while it facilitates easy cleanability. The smooth, rubber cover makes it easy for operators to safely grip and handle the hose. 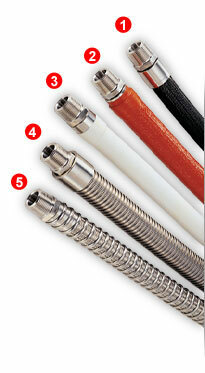 FlexChem hose incorporates a FEP, smooth bore design which gives it superior flexibility. Through a proprietary process, the FEP liner is bonded, covered and reinforced with multi-layered rubber, spiral-wound polyester cords and a double helix wire which gives it superior flexibility. Grounding is possible via its internal wires. This wire helix "back bone" also supports full vacuum service. FlexChem series hose is available in white FEP or a PTFE conductive black liner where electrostatic dissipation is required. To ensure continuous fluid contact with FEP throughout the hose assembly, the FEP liner can be factory flared through: flanges; sanitary fittings; male and female cams. Corrosion resistant. FEP & PTFE are fully resistant to the broadest range of industrial chemicals and has a zero corrosion rate and lower life cycle costs. Cleanable. Non-stick, low porosity tube does not trap bacteria and can be cleaned with steam, detergents, caustics or solvents. Sanitary. FDA-approved materials meet or exceed 3A requirements. Flexible. The most flexible rubber covered hose in the industry. Does not fatigue or stress corrode like metal hose. Durable. Designed for extended use in hostile environments involving severe chemical, thermal, and mechanical stresses. Does not suffer aging or embrittlement, even with extreme thermal cycling. Protects hose exterior from damage when dragged over rough surfaces. Protects hose from extreme exterior temperatures. Used for insulating hose. Protects personnel who handle the hose from extreme interior temperatures. Provides a smooth, cleanable covering over braided hose. 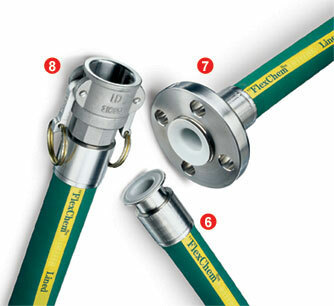 Protects hose from kinking by not allowing handler to exceed the bend radius. Provides kink resistance and protects hose exterior from scuffing and damage when dragging over rough surfaces. Over 40 standard fitting styles are manufactured including: flanged, sanitarym JIC, NPT, cam lock. All fittings feature PureFlex's exclusive high performance barb design. Ultra smooth internal surface finishes meet or exceed Pharmacopoeia Class VI, FDA, USDA and 3A standards. The thick, FEP tube can be passed through the end fitting and flared radially outward against the sealing face of the following fittings: Sanitary, Flanged, Female Cam, and Male Cam. *Flexchem hoses with Flare-Thru end connections are not rated for any vacuum service.